One of the sailing instructors of our (small) sailing school is interested in teaching on a 420. I kept an eye open and found an i420 on craigslist. I would like to clean it up and offer it to the school. The boat I got does not have the trapeze wires, spinnaker, or associated rigging. I'm having a little trouble finding parts and specs or a used market. I know the c420 is a similar design but haven't found info on what parts might be interchangeable. A 420 without spinnaker or traps sounds like a club420 to me... are you sure you haven't bought a club 420? There are some 420's set up without traps and spinnaker for team racing, but I believe most are switched to that set up for events. Well the trap parts are pretty standard parts that can be taken from almost any Trap boat. You need terminals at the top or eye straps, 1/8" Amsteel for the wire, CAM adjusters at the other end. (A trap handle can be easily made out of a doughnut and flex tubing) line to adjust 6mm double core, and trap rings. All of this can be bought at APS west etc. but find an old 420, 470, 505 etc. and the parts can be salvaged or bought used. Spin is also mostly standard parts. Pole would be the exception. You will need one the correct length. All the rest of the parts are standard blocks lines mast fittings. 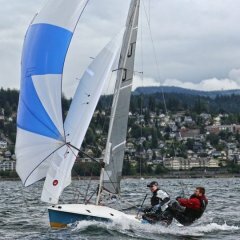 The i420 class site www.420sailing.org has a limited classified section for used gear. Try to contact them and see what they have access to. Yes Mozzy, I'm in the NorthEast of USA. The mast is tapered and has holes for the trapeze slugs and the forestay wire comes straight out of the mast. These things look unique to the i420. I see Lous' suggestions just a little unsure of the overall trap wire lengths... same w/ the pole. And I see APS has 420 parts but c420 parts won't work on the i420 mast n such. If it's a tapered mast then it's an International 420. The club/collegiate 420s don't run tapered masts. Your first post made it seem like you bought a collegiate 420. A collegiate 420 would not have a spinnaker or trap setup but the club 420 would. Two of the local teams have new 420s fully outfitted. So when they host, the gold fleet races 420s JAM, the silver and bronze race FJs. I looked pretty close at them and all the parts match what I have on the 505. Eye strap at the top 1/8" Amsteel adjusting cam and ring. Length is obviously different but the length of your tap wire is subjective. I have the handle 6" above the gooseneck on my boat. Others have them higher than that, some lower. Seems like +/- 4"-6" from my location are pretty common. If he has the T-balls the loops are pretty easy to come by at APS. The rest is pretty pricey ($100 or so for each side) but I would think there are parts out there used. I have backup rings and cams for my boat. Rings break and the plastic sheave on the cam breaks. For the pole I would check i420 rules it probably specs the diameter and length. APS forespar etc. can all make this for you with double ends. Does the mast have a pole ring? Thanks for the leads on the where to procure the trap wires and making me realize the wire lengths are subjective. Eventhough KO doesn't list the trap parts on their site, you're right, they would know the setup since they carry the whole i420 package. hmmm, well, the mast foot looks like it sits in a notch in the keel root; there's no receiver plate. What range will be taught on this i420? They are no where near as durable as club 420s and a good level of maintenance will be required if the mast is constantly stuck in the mud and rails are banged into the dock. It's a lightweight boat. She has curvy flaired gunnel and has a 5’4” beam. 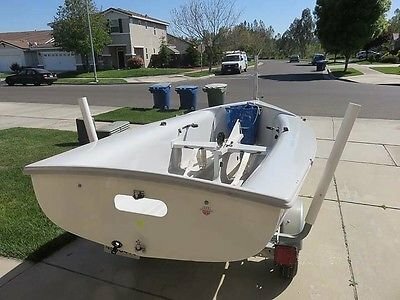 Probably more than you paid for the boat; I have a set of wire trap lines off some dinghy I would donate to the cause but the hounds end likely won't match, I believe they are designed for a shackle vs. t-ball setup. Wow, that's a golden oldie! We had one with that layout as a club boat years ago, made by Honour Marine UK. Just used it as a nice club boat without spinnaker or trapeze. Just out of interest does it have the forward mast step and second set of shroud/chain plates for the Una rig? I always thought the single sail version would make a nice single hander. It's easy enough to clip the top ends off the wire and change them to something that fits, then make up the shorter length in a longer adjustable end which is ideal anyways. It's easy enough to make your own partners. Often times older boats like this didn't have a partner, it wasn't identified as a need until later. Some old 505s are the same way. You can build something that extends aft off of the foredeck to create your own parters. The 110 keelboat class does this as none of those boats came with mast partners until the latest builder. I just extended the partners on an older Waterat 505 aft by a couple of inches to allow for increased rake. Thanks for your offer Sam* but new T-balls for your wires would be kind of expensive and I found an even less expensive KO trap wire rig set here https://www.kosailing.com/hardware-i420-parts-i420twr.html . Looking for a used spinnaker now. It had the stayed una rig and also an unstayed version bit like a small Finn. Long gone now but would have been fun. To get the boat in the above pictures up and sailing and getting friends out on the water, you can use the basic c420 rope lengths to work on your boat. There will always be subtle differences depending on how you have the boat rigged, but for recreational Sailing if you follow the model set up for the C420 you will find is easy and basic to implement on your boat! If you are running internal halyards just make sure the diameters will work for the mast set up. If you are looking to set it up as an i420 then further discussion may be needed. 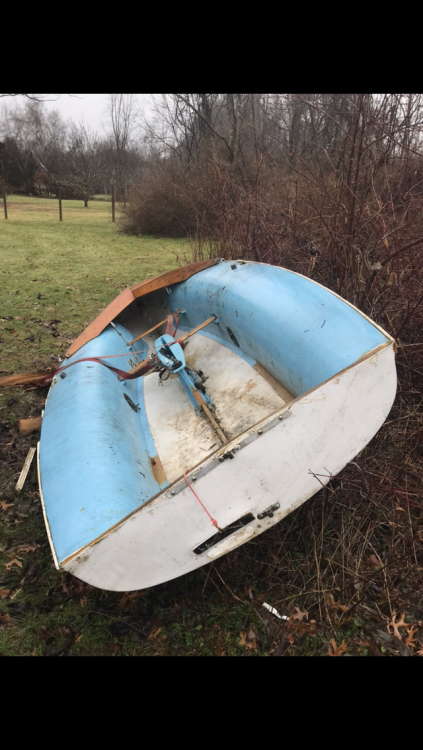 hopefully you are just looking to get it back into working shape and enjoys an afternoon on the water. Boat gmthing will be Sails. They are not interchangeable between the i and C due to thentapered mast in f the i. So depending on what mast you have will determine whether you use i420 sails or c420 sail.